Now, quite honestly, I usually don’t care too much what my luggage looks like. If it’s sturdy, durable and in good condition the color or design doesn’t really matter to me. However, seeing these roller suitcases from Halsea has me rethinking that. They’re perfect for the jet-setting diva! Made of printed and laminated canvas with leather trim, the inside is lined with pink satin and three organizer pockets. An added bonus: they fit overhead compartments on most commercial airlines. I love the designs, and the cheerful prints will definitely make baggage claim a cinch. 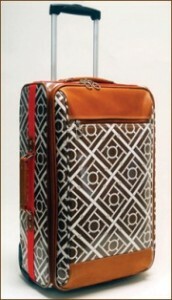 The suitcases come in 4 collection designs, and most of the collections offer at least two different colors. Dimensions: 22″ tall x 14″ wide x 10″ deep. The price of $335 isn’t small change, but these seem like pretty sturdy bags so it should last a while. Visit Halsea to purchase.